If you’ve been considering redecorating but have been unsure on which colour to choose, it’s worth digesting these green living room ideas. A colour with such variation in tone and such uplift on a room’s atmosphere, it’s become one of the most coveted colours for our interiors (just look at the elegance and richness of this Fenton Whelan emerald green living room). And its surge in popularity is showing no signs of slowing down. From verdant forest green to softly-does-it sage, there’s no shortage of green paint colours for your living room (see our other article on ideas for using green outside of the living room). But green paint or green living room wallpaper are just the beginning. Upholstery in opulent peacock green velvet and emerald green granite and marble used for kitchen countertops and accent tables are two of the more high-end areas to explore in your green living room decorating ideas. Moss green wool tweed on a footstool or an olive-toned lampshade on a glass lamp are more traditional suggestions of how you might want to bring green into your sitting room. Not to mention the easiest green of all – greenery, from potted succulents to larger fiddle-leaf fig plants or olive trees. 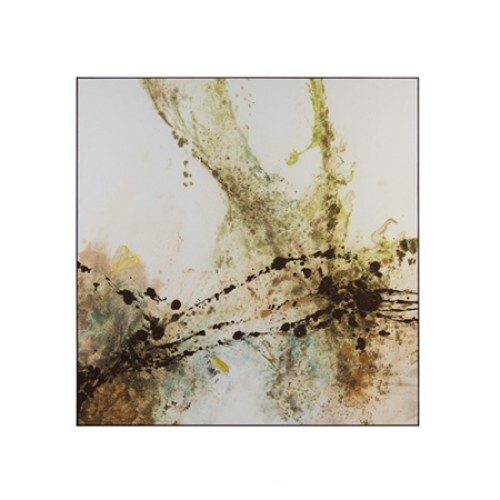 Artwork of scenes rich in green landscapes, window treatments of decadent green drapes, scatter cushions with a hint of green or fully saturated in its calming presence, and rugs underfoot woven with jade green thread – you won’t find that you’re short on options on how to use green. The question really is how much do you want it to dominate your living room? Is it a feature, an accent or just a quiet, reassuring background presence? Green, as with any colour on the spectrum, has various different hues and tints that create many versions of it. And, once you’ve decided that you’re more of a lime green person than a mint, what are the pairing successes to try? These are some of a selection of the more traditional and contemporary variations of green to figure out which colour scheme is more to your taste. 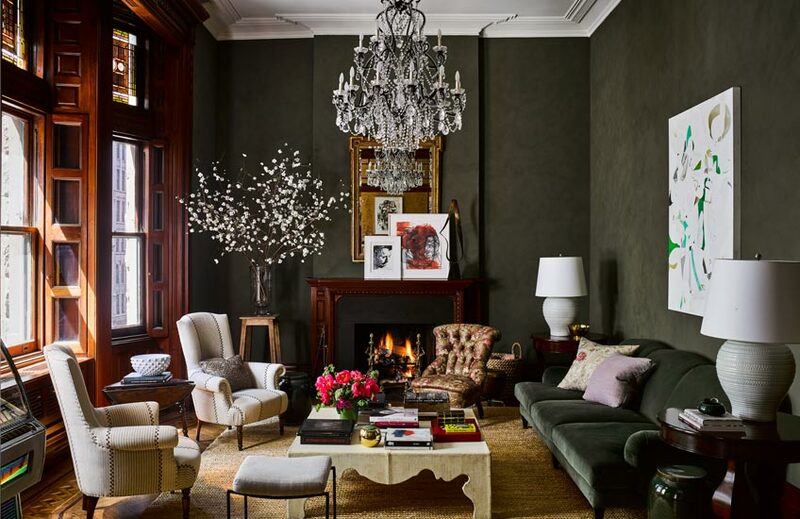 One of the most understated ways to involve green is to opt for a grey and green living room. Both tones can have either a warm or a cool base in this scenario, as long as they’re soft rather than intense to result in a sophisticated, classic room design. Try to avoid lots of dark-coloured furniture in this sort of living room though. One feature piece is plenty, and then add layers of lighter textiles and varying textures so the overall tone of the room doesn’t feel flat. Grey and green can also be interpreted in a much more contemporary way. Picture polished concrete against a jewel green sofa with crittall-style windows. A shade of green that’s often deemed as retro or juvenile, but lime green living room accessories can provide a refreshing update if they’re used elegantly. 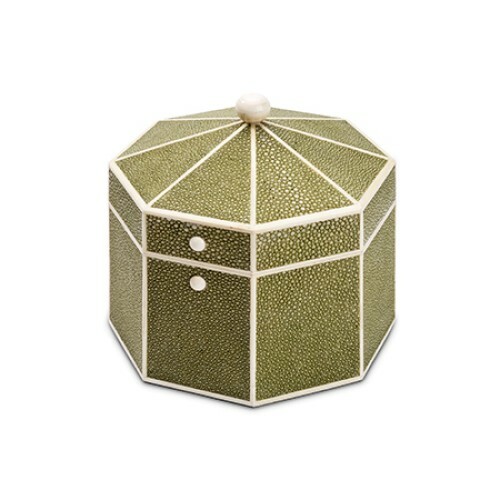 Lime green and pale, silvered grey are a pleasing match. Darker wooden furniture and chocolatey fabrics for upholstery (such as aged leathers or nubuck suede) add some weight and a level of masculinity not always associated with lime’s inherent ‘zing’. 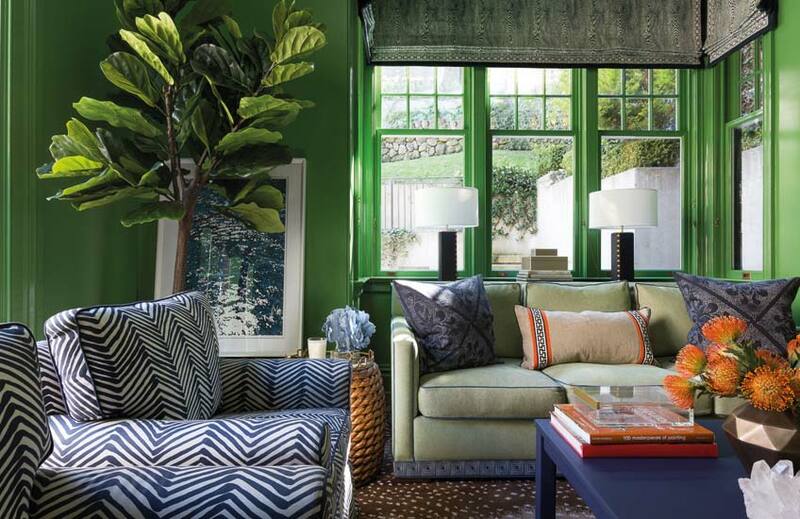 Or, take lime to more exotic climes by teaming it with blue and red accents and oversized bursts of plant life. Fundamentally, use lime green if you want your sitting room to feel awake more than anything else. 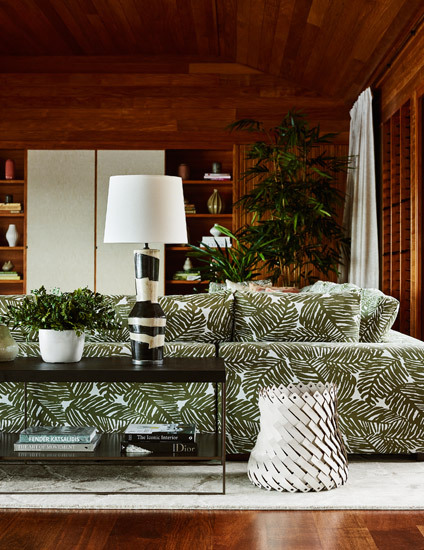 When it comes to sage living room ideas, it’s helpful to know that it also lives happily with most tones of wood, from pale pines to rich walnut, as well as with a host of textures, like leathers, linens, rattan and metal. If you live in a period property, sage is a pathway to a refined use of colour. 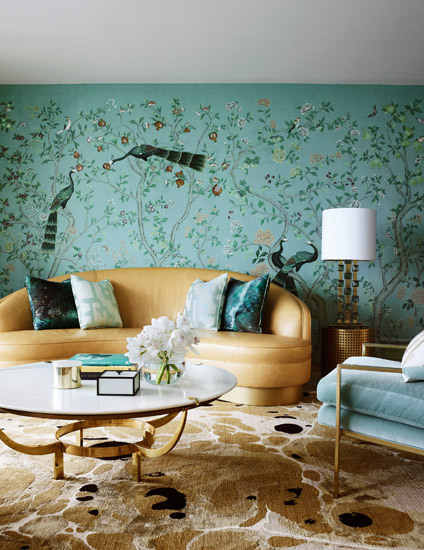 A mint green living room falls somewhere between lime and sage. It has the invigorating nature of lime, but the fresh, calm side of sage. It’s also one of the variations of green that people often find harder to use. Try mint if your scheme is more classic. It makes a grand statement on fully-lined curtains and a timeless one on lamps. In terms of furniture, try to add an item or two in reflective glass, such as a glass-topped side table and mirror that by featuring a glass chandelier or pendant light to play on mint’s characteristically light nature. 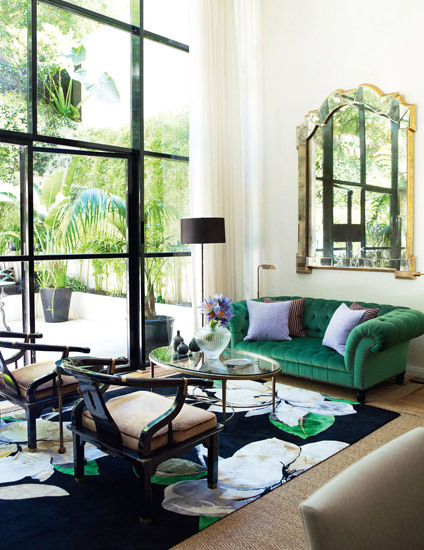 Dark green living room ideas don’t have to mean dark all over. You can, of course, choose loden green, moss and even bottom-of-the-lake shades of green that verge on dark grey to cover your walls or one of your sofas. But, dark can also simply mean darker. Emerald green could be counted as a darker green shade too. Pair any of these tones with brass – polished or beautifully tarnished – to bring out the best in them. Polished woods are a well-suited partner to darker shades of green, either on floorboards, furniture or even wooden wall panelling. Olive is a compelling use of green that’s viewed as being one of the bolder tones. Not because it’s necessarily loud or controversial, but because it has been used less than ideally in the past giving it the unfair label of being a dated colour. Use olive to its full potential though, and your home will feel luxe and self-assured. Olive green living room ideas are dominated by statement upholstery pieces covered in the natural hue. 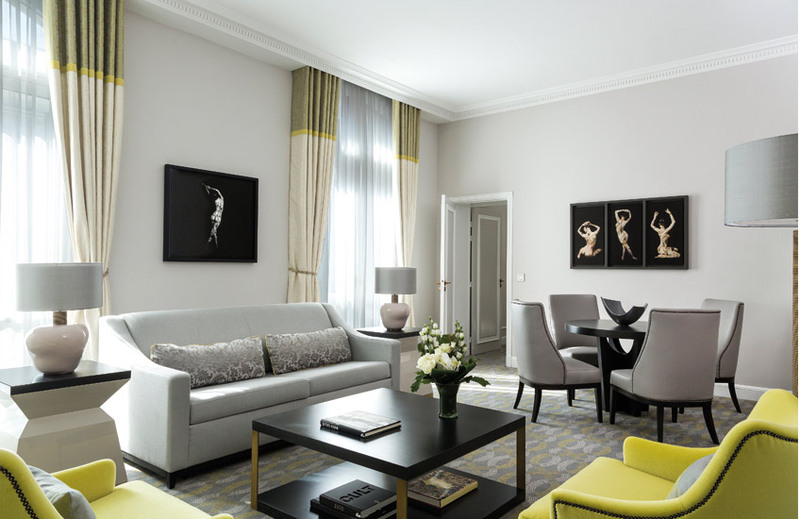 It can shrink into the shadows if it’s not used overtly, so go large-scale with an olive green sofa or smaller pouffe if Art Deco is your thing. Should a sofa’s entirety in olive scare you, try olive green as a motif within your fabric’s pattern to temper it. Olive’s also a shade that loves exposed timber, and is one of the few tones that really suits red-tinted woods like cherry. Whether or not you choose to use green on your living room walls or on any key pieces of furniture, green living room accessories should absolutely feature in your interior design vision. Here is where you need to ask yourself once more, how much do you want to commit to green? Accessories are where you can either build up the level of green, maintain it, or tone it right down, so you’ll need a clear direction of where you want your look to go. Green rugs for a living room are a worthy contender because you’re likely to have a piece of furniture partly over it, such as a coffee table, and because the sofa will always divert some of the attention away from the rug too. So, if you’re concerned about a green rug being too dominant, it won’t ever be as loud in appearance as you might have first thought. 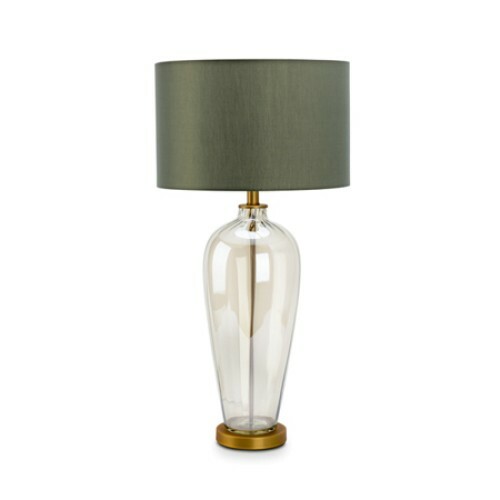 Lighting is another accessory that will inject a dose of green into your sitting room’s scheme. 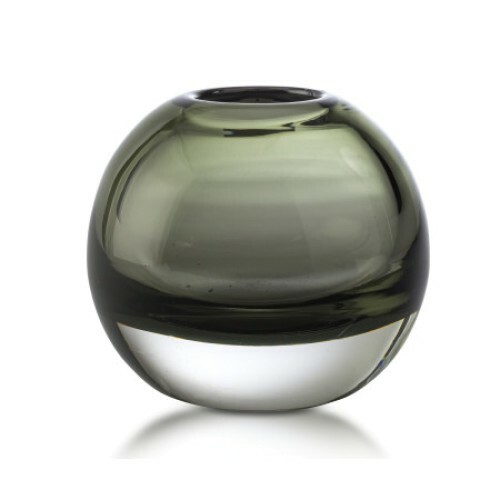 Glass lamp bases can come with a green hue or with a glazed finish featuring a green print. Have a look at designs by Eichholtz for inspiration. Even the smaller decorative aspects in your front room will unify your green scheme. AERIN’s moss green-lined photo frames are a prime example. 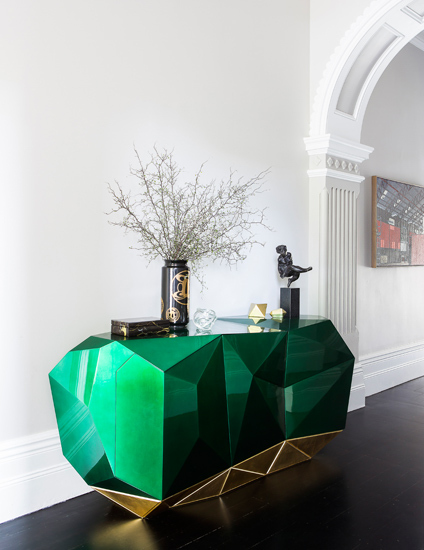 Their matching velvet-enrobed tray used in a separate part of the room, such as on a coffee table or console table to display a small collection of ornaments, means that exact same tone of green is dotted throughout the room. Michael Aram’s green marble trinket tray inspired by the Amazon rainforest is another small accessory that will help you to build a green palette. And finally, a collection of unfilled vases can be treated as sculpted ornaments in their own right. Link the tone of green and the style of work by using several pieces from the same designer, such as bottles or vases and decorative bowls; Guaxs does a series that correspond perfectly to one another.